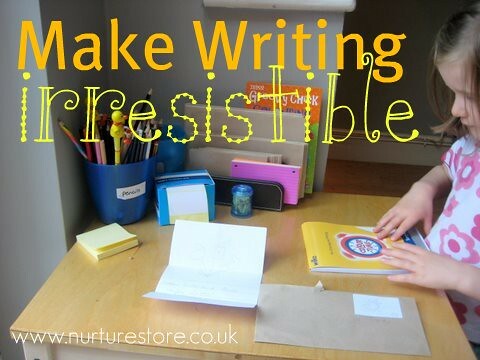 If you’re looking for ways to promote literacy and get children writing, one easy but effective way to encourage writing is to make it irresistible. Don’t hide the paper and pencils away in a drawer – set up a creation station! Provide an assortment of papers in different colours, shapes and sizes and pots of pencils you know they’ll love. Whether they’re a sparkly, glittery, superhero, football or dinosaur kinda kid, it’s easy and inexpensive to find a few pens to suit their passion. Another sure way to get my girls interested is to mix in some ‘real grown-up’ supplies from our home office – highlighter pens are the tops! Add in some envelopes for letter writing and a roll of stickers to transform into postage stamps. Can you find some supplies tonight and set up a creation station ready to surprise the children in the morning? Bet you can! These are great tips! I’m always amazed at the things my kids create, given the supplies! That’s a great way to deal with junk mail, maryanne. Last week I created a DIY writing practice frame from tissue box. Thanks for the idea link Esther. I am very curious to read this tips since I have a reluctant writer. The challenge that I have is that she IS more motivated on the day she finds something new on her desk, but next day it’s already “old news” and she doesn’t want to write/draw more in the long run. I am curious if you have any advice. Hi Natalie. Anna is 4 and 1/2 I think (?) so a few months younger than L, who has only recently become a big fan of writing. My own opinion is that at this age writing should be part of play and fun. There are lots of ways to encourage ‘writing’ in play and I always like to see what a child in really interested in, and mix in a new skill that way – for example kids who love role play could write orders in a play cafe. I also like to show that writing has a real purpose, rather than just being some chore we’re asking them to master – so we love sending postcards to friends (and excitingly getting replies). And how about moving the writing well away from a desk: chalk on the path, marks in play dough, sticks in sand? Activites like baking bread are great for building finger strength, in preparation for holding a pencil, so if you’re keen to develop writing skills but she doesn’t want to write maybe you could switch to this kind of play and come back to pen and paper writing when she’s showing more interest? Our writing archive has some more ideas that you might like? I hope these suggestions are of some help. JDaniel is so happy to use a plain pencil or pen to write and color. These are great tips. My son will be three in a few days. I’m trying to make the supplies (that are age-appropriate) more accessible for him yet at the same time, keep them out of the hands of my very curious 15 month old (he still mouths EVERYTHING). Any tips on ways to display supplies in an inviting way while still keeping them out of the hands of those who shouldn’t handle yet? Hi Jackie, we had a similar situation with an age gap when my girls were younger. It’s a bit of a pain to manage but of course this too shall pass and both yours will be able to freely join in soon. We decided B needed a special place for her very grown-up supplies (where little sister couldn’t reach by herself) – which made them even more irresistible to big sister! One location was on a shelf which was just high enough for the big one to reach. I also gave over one of the kitchen cupboards which had a door lock the little one couldn’t manage and filled it with supplies. Both these worked well for us. Cathy, couldn’t agree more with your ideas. My daughter who’s 5 is enamoured with writing and she loves pens of all shapes, sizes and colours! I also make available note books and diaries of all sizes and types for her to write when ever she wants and whereever she wants. Hi Cathy, I love your writing station and all the tips in the comments. It IS difficult when you have younger children who want follow and do whatever big brother and sis are doing. A special place for supplies works great! At times we also had fine motor activities that included little sis, such as pudding, water or jello painting. Yes Kristi I agree – wherever possible we include all the kids in activities, if they’re interested – adapting to suit each age/stage. Thanks for the response to my comments, Cathy! I will definitely try more of your writing ideas here. Perhaps a few months will make a difference! When we get our own place again, I will definitely set up a creation station. Thanks for the wonderful ideas! Great tips! I never put the art supplies away. All the pens and pencils and crayons and markers are sitting out in cubbies in the hallway so that Grace can grab them and draw or write any time. Fabulous idea!!!! I always have this stuff tucked away for them (they know where to find it), but this is so much smarter! ha ha… love it! Thanks for sharing at For the Kids Friday at Sun Scholars! We have a ‘creation station in our kitchen and it is contantly used. For writing in particular I find that the large postit notes are a favorite. My son loves to post them all over our house. He will cram 15 words on a postit note right after he has trouble writing 1 sentence for a homework assignment. A little suggestion goes a long way! It’s usually best in our house if you don’t say anything about the activity, just let them discover it and think it was all their idea! Yes Kristin! I find the little ‘hidden’ invitations work so well.